Salami is an Italian salted, fermented, and dry cured sausage typically made of pork and sealed in natural or plastic casing and hung to dry. The processed meat product has become a staple in the American omnivorous diet and in the food industry, with standardized forms appearing on almost any grocery or convenience store shelf – whole or sliced in grab-n-go packs labeled pepperoni, soppressata. Quite recently the term charcuterie has started to appear on many restaurant and tavern menus advertised as a board of cut, cured meats at the same time that American is experiencing a resurgence in craft beer and ciders and farm-to-table, fresh local foods. One might wonder what to expect on such an auspicious and elusive board. 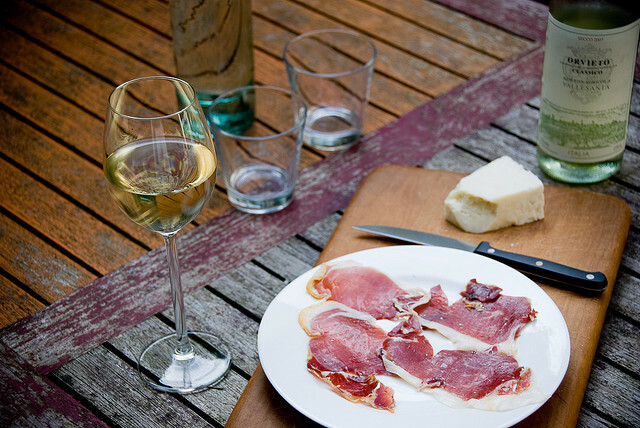 What often shows up at the table is a board topped with salamis and on occasion, a prosciutto. Charcuterie, a French term for any processed meat product, is synonymous with the Italian term salumi, the broader taxonomy of which salami is only one category. Even though these terms are synonymous, they do not connote the same products and categories of meats. Since food is culturally specific, the traditions and methods of food production are affected by the customs, rituals, regional terrain, breed of animals, and needs of an isolated population. Types of meats and recipes can vary widely between even the neighboring countries France and Italy. With the introduction of the Chinese pig into England in 1760, and its subsequent crossbreeding with the more svelte European boar produced a luscious, fatty porker that, as it spread across Europe, revolutionized food making practices. Many of today’s preserved meat traditions can be traced back to that fatty, hybrid pig. 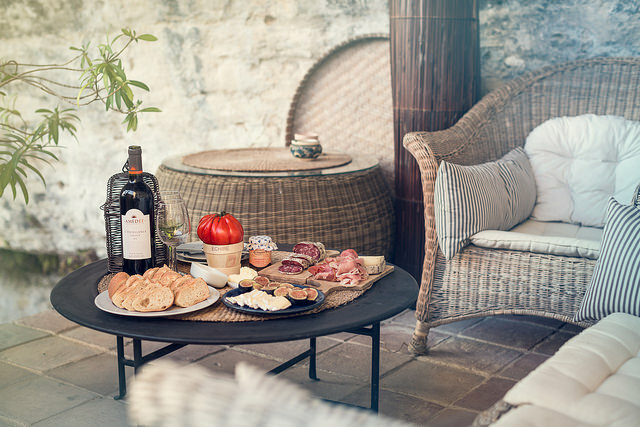 Charcuterie includes various categories of meat such as ready-to-eat meats: the dried sausage saussicon sec, an equivalent of salami that also includes Andouille, chorizo, and frankfurters. Ready meats also include jambon, the cured hind leg; rillettes, potted pork belly sometimes mixed with goose or rabbit; gallatines, made of head meat; pates, terrines, and porc roti, roast pork loin; and confit, meats preserved in fat. Charcuterie that needs warming include Quiche Lorraine, a pie made of ham, egg, and custard, as well as pigs ears, feet, and tails. Lastly, there is charcuterie that requires cooking: uncured sausages in casing or rolled flat without casing, blood sausage, sausages in brioche, puff pastry, or short-crust, tripe, and lard, the French term for bacon. 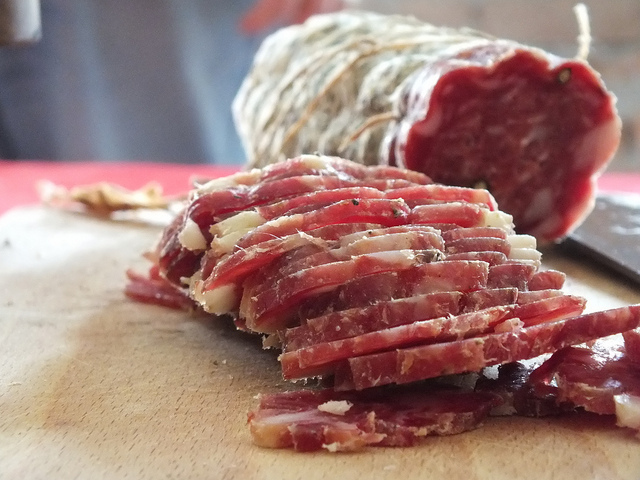 Salumi includes similar categories as its French counterpart including the cured, salted, fermented, smoked varieties as well as cooked sausages, confit, and pates. 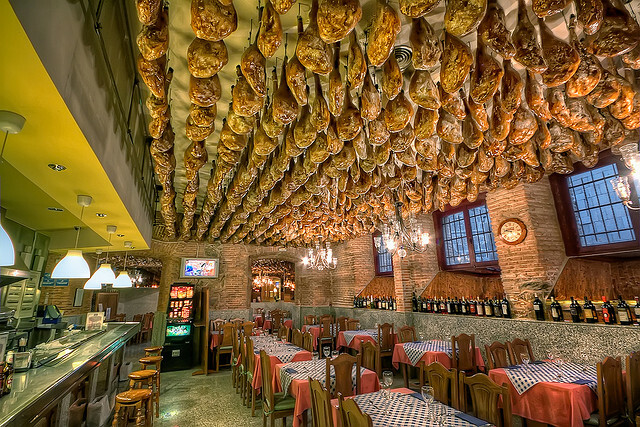 These include some of the most popular cuts in America: prosciutto, dried from the hind leg of the pig of which the smoked variety speck is included; capacollo or coppa, made of the head and neck muscle; guanciale, made of the jowls; prosciutto cotto, baked ham; and pancetta, a salt-cured bacon made of pork belly, to name a few. Mario Batali’s “Salumi: A Glossary” is an excellent primer for the many types of salumi one might find at an American specialty food shop. Each region across the globe has its own preserved meat traditions, with its own flavors, aromatics, textures, and preparations; many regions across Europe, Russia, and the British Isles as well as sub regions within nations may have similar production methods, although they often butcher the meats in slightly different ways. These practices lead to variants in the types of meat produced and make Italian salumi slightly different from French charcuterie, but also surprisingly similar to each other as well the Spanish, Swiss, and German varieties at their borders. Thusly, an American Charcuterie Board, if laden with Italian cold cuts, might be better termed a Salumi or Antipasto Board. Expect a knowledgeable restaurant or tavern to serve a Charcuterie Board featuring not only dry-cured or smoked sausage and ham hocks, but also a fair portion of pate, and if lucky, rillettes. Expect the most excellent of Salumi Boards to include a heat-cured sausage Mortadella, speck, an aromatic finocchiona, the beef salami bresaola, or the spicy ‘Nduja. Grigson, Jane. The Art of Making Sausages, Pates, and Other Charcuterie. New York: Alfred A. Knopf, Inc., 1968. This entry was posted in Charcuterie and tagged charcuterie, cured meat, pate, salami, salumi by The Cheese Traveler. Bookmark the permalink.